It’s that time of year, the days are getting shorter, the shops are awash with Easter Eggs, and the Melbourne Food and Wine Festival is on. 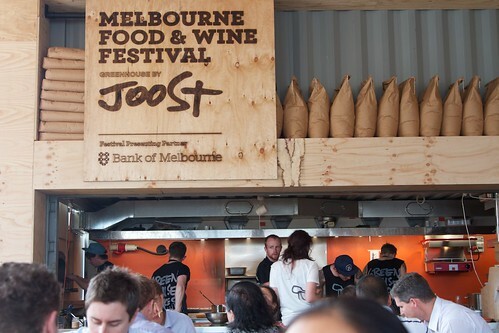 Now in its 20th year, the festival is bigger and tastier than ever, with one of the main attractions this year is being the Greenhouse by Joost; a 20-day pop-up restaurant on the Southbank side of the Yarra, near Queens Bridge. Marg and I stumbled upon the Greenhouse when it was last in Sydney. Unfortunately, we weren’t able to grab a table, and had to settle for drinks on the roof overlooking the Sydney Opera House; life can be hard. Now it’s back in Melbourne, and has popped up on the doorstep of my office, so I was determined to check it out this time. I’ve been watching it being assembled over the last few weeks, and I was pleasantly surprised that they’d finished it for the opening on Friday. Melbourne construction can be fickle at the best of times. After being stood up for lunch by a very busy and apologetic Margaret, I mustered some colleagues to check it out. So we walked down at 12:15 only to be told that lunch service wouldn’t start until 12:30, but we would be free to order an assortment of drinks served in jars. A big part of the Greenhouse is its holistic approach to dining. A number of the ingredients are grown on the building itself (like these mushrooms), others are biodynamic certified, and recycled items are used for the glasses. Every part of the experience has been designed and refined to sustainable perfection. The five of us started with a round of drinks. My friends all ordered custard ciders, and I ordered the homemade lemonade, which had a delicious dollop of honey at the bottom. 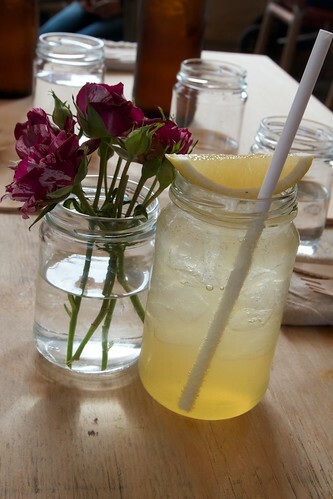 I loved the attention to detail with the drink, the lemon slice, the paper straw, the jar. 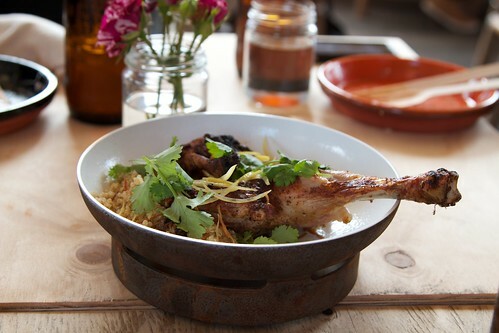 The entire menu is designed to be shared, so we each selected a dish. 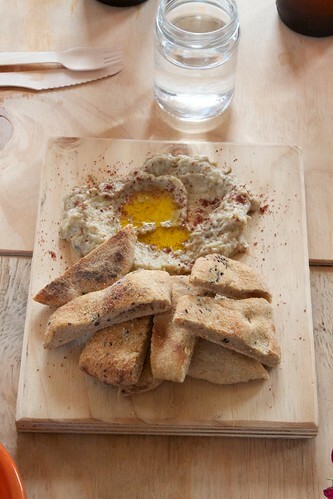 The first item was the smoky eggplant plant dip with flat bread ($12). The paprika was a nice touch, as was the little well of olive oil. 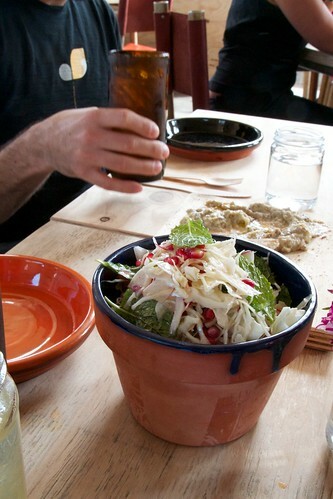 Next up was the cabbage, radish, pomegranate salad ($15), which was nicely presented in a plant pot. It was little bit heavy on the mint leaves, but it was more than balanced out by an abundance of pomegranate seeds. The wild rice, shiitake, weeds and curd ($22) came quickly after. We were informed that the weeds were grown on the premises, but I’m not too sure how that works considered it had just opened. Our approved vegetarian marked this as a favourite, but I felt it lacked any kick. The pumpkin, chickpea tagine and green chilli yoghurt ($22) came up next, in a rather hot little dish. 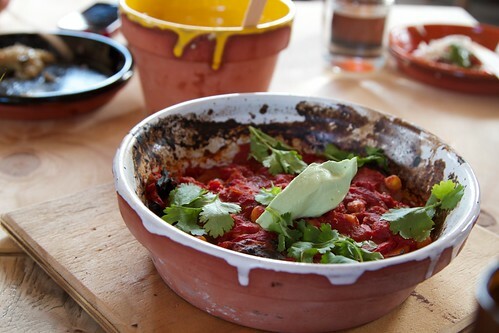 This was my favourite of the vegetarian dishes, and I loved the thick tomato sauce. The green chilli yoghurt was also a talking point. It wasn’t all rosy though, it was very difficult to share between five people. Spiced chicken, quinoa and yoghurt ($25) was the final dish to arrive. We were given a special non-wooden knife to cut the chicken up with (like real grownups), but it wasn’t really made to be split between four. The chicken was crispy on the outside and tender on the inside. A perfect combination. The Greenhouse is here for only twenty days. Even if the menu isn’t necessarily your thing, the build and the design aesthetic are well worth the visit. 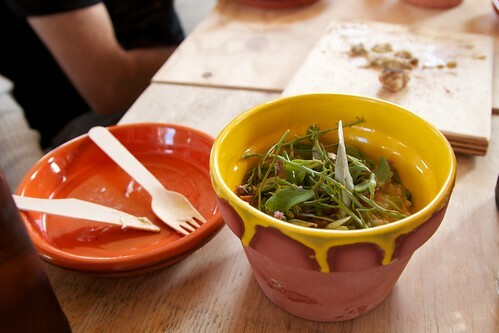 This entry was posted in Eating out and tagged CBD, Melb food & wine festival. Bookmark the permalink. Trackbacks are closed, but you can post a comment. I’m curious about what drew you to want to dine here? The fact that’s only built for 20 days or the “sustainability” aspect of it? 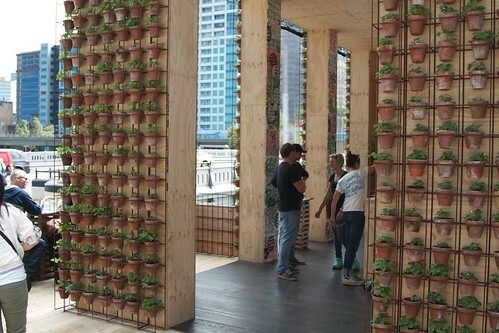 To be honest, when we came across the Greenhouse in Sydney last year we didn’t know anything about it and just went in because it looked cool/interesting and (my words at the time) ‘like something I’d expect to see in Melbourne’. From our visit in Sydney we know that Greenhouse makes a great bar, but as Gerard mentioned we weren’t able to eat there. So this time around we were interested to see whether, concepts and/or gimmicks aside, Greenhouse functions successfully as a cafe. I won’t lie, we also love a good pop-up. Now I just need to find time to get there, how dare work be busy when I want to go out for lunch?